Contacts: This will send to contacts based on a date range, such as when the contact was created. Groups: This will send to contacts in specific groups, and will also trigger when new contacts are added to the group. Campaigns: This will trigger when a specified campaign has been sent to a contact. To learn more about the types of Autoresponders, click here. Once you’ve selected the source of the Autoresponder continue to Sequence to set up the sequence of campaigns that will automatically be sent to the recipients. After selecting the initial campaign, you can then select the following sequence of campaigns. These are set so that campaigns are sent after a certain amount of time. They can also be triggered by various behavioural conditions, such as whether the previous campaign was viewed, not viewed, clicked, or replied to. You can also add multiple rules in an autoresponder sequence by clicking Add Rule. Please note that multiple rules should only be used on the last rule of a particular sequence, as there can be multiple campaigns that could be referred to if you set up another rule. If you’d like to automatically trigger further campaigns based on the last rule of a sequence, you can set up a new Autoresponder that is triggered based on when a campaign was sent. 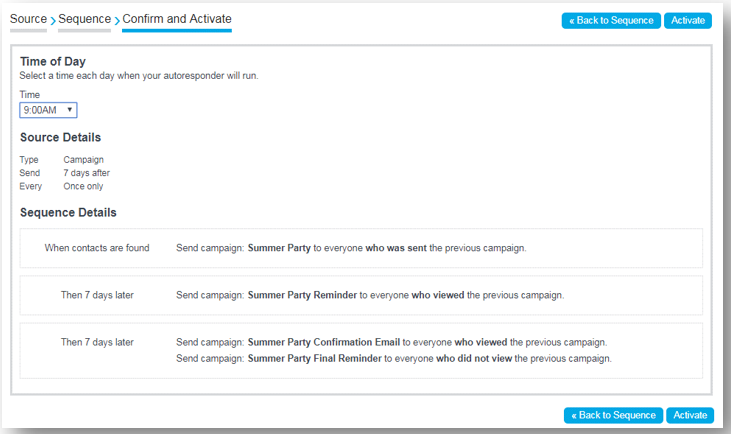 Once you have created the sequence for an Autoresponder, continue to Confirm and Activate to set the timings for when campaigns will be sent, as well as reviewing the Autoresponder you’ve created. When you’re happy with the Autoresponder, click Activate to turn the Autoresponder on. Autoresponders can be reused and repurposed as needed, so you can create workflows and change the campaigns in the sequence. In the Sequence section, click Select/Change to change the campaigns. You may also need to change the Source to reflect the new workflow.